This tutorial will guide you through the process of implementing a 'tri-state' CheckBox functionality in the RadTreeView using MVVM. The RadTreeView control supports check boxes/radio buttons elements next to each item out-of-the-box. However, their 'tri-state' logic implementation is designed to work when the RadTreeView.Items collection is populated with RadTreeViewItems. Basically it will work as expected when the RadTreeView is declaratively populated or its Items collection is populated in code-behind. However, the RadTreeView control is mostly used in databinding scenarios following the MVVM pattern. And if your applicaiton requirements include a 'tri-state' check box logic, then it's best to define a CheckBox control inside the RadTreeViewItem's DataTemplates and implement the 'tri-state' logic entirely in the view models. Public Property IsChecked() As Boolean? 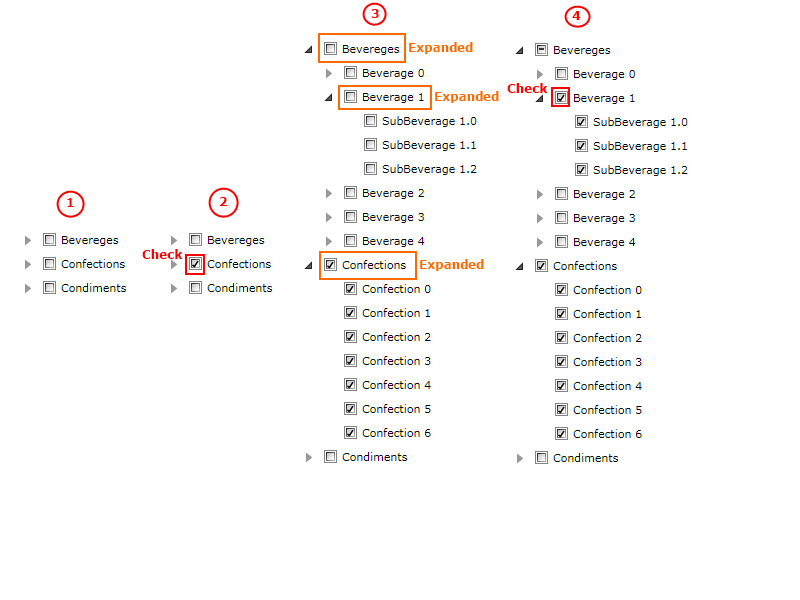 Please note that the CategoryViewModel class inherits from the Telerik.Windows.Controls.ViewModelBase class. It provides support for property change notifications and we need to notify the RadTreeViewItems when the IsChecked property is changed. Now let's extend that sample model to include our 'tri-state' logic. Firstly, in order to update the checked state of the parent items, each item will have to keep a reference of its parent item. Then we need to implement the logic that determines the checked state of each item. For that purpose we have to traverse the children colleciton of a checked item as well as to find the checked state in which its parent item should be set. We can also create a method that updates the checked state of the parent item. In order to simplify the code, we can use a lambda function to count the number of the checked children of the parent item. If this number indicates that all its children are checked, we can set the parent item checked state to checked, if the count of its checked children is 0, then we need to uncheck it. In all other cases, its state should stay indeterminate. Private Function DetermineCheckState() As Boolean? As the items ViewModel is ready, we can create a MainViewModel to define a collection of CategoryViewModel objects that will be used as the RadTreeView.ItemsSource. Finally we need to set up the RadTreeView control and its ItemTemplate. Please note that we won't use the RadTreeView check-box support, but instead we will define a CheckBox in the ItemTemplate of the control. The telerik alias represents the telerik namespace: xmlns:telerik="http://schemas.telerik.com/2008/xaml/presentation" The vm alias represents the viewmodels local namespace. For example: xmlns:vm="clr-namespace:TreeViewMVVMCheckBoxSample.ViewModels"
You can find the sample solution in our CodeLibrary.